It started as a rumor on the internet, but BoiFromTroy, a big fan of the boys in white for obvious reasons, is calling it official. 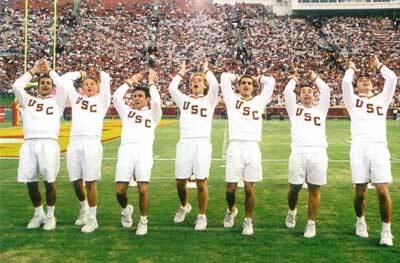 Whether you like the yell leaders or not, it was an 80-year+ tradition, and USC is just starting a new spirit squad called “Team Trojan”. So it seems pro yell leaders and anti yell leaders will both lose. This does remind us of a story however. Mean? Sure. But funny? Definitely. Two guys come stumbling out of Traddy’s, spotting a yell leader in full regalia. The one guy sneaks up and punts the yell cone while the other guy is able to run underneath and catch it in stride. The yell cone is brought back to our place and used to yell at people on the row all-year-long. Dr. Stephen Krashen’s language acquisition hypotheses must have been quite engrossing. I spent four years at ‘SC, my classes were at Grace Salvatori Hall, I lived on campus. I taught at Salvatori Hall. How did I miss all this action? Was I, like, totally nerdsvilille, linguistically speaking? C’mon. Give ’em a break. Not sure what year you graduated from SC, but — in my era (late-80s and early 90s) — the yell leaders were the biggest studs on campus (outside of the football players). All of ’em — every single one of ’em — were big men on campus. I know that the squad has changed drastically since then — but so has the entire USC student body. When you are admitting 4.0 students with perfect or near-perfect SATs, you’re not generally going to have the biggest studs and hottest girls from America’s high schools. The news that USC will not continue with this tradition is a shame. Summer of 2006, I contacted both Justine Gillman (Sprit Leader advisor) and Scott (volunteer coach) about trying out for the USC Yell Leader squad. I was a transfer student from Arizona State University where I was a yell leader and in which we won multiple competions for the sport. I have also 15 years of gymnastics experience under my belt which supported my Yell Leader ability and excitment. I was told by Scott after a 10 mintute tryout that I was not USC Yell Leader material, and that he was disappointed with the turnout of boys for the original tryout a week before. When both Scott and Justine were questioned about the decision they both could not provide answers and opt to not return any of my phone calls or emails. What exactly does the Yell Leader advisor or volunteer coach what in a squad? Unfortunatley it is obvious to me that they don’t know themselves and therefore no squad this year and an 80 year old history broken. Justine and Scott get a clue! If USC is winning national championships in multiple areas, don’t you both think that picking 8-10 men to continue a tradition is simple? Maybe next time, people that have a clue will be the people making the choices.